Julie Zetlin performs in the Olympics. Bethesda has the unique distinction of being the hometown of rhythmic gymnast Julie Zetlin -- that also makes Bethesda the only town in North America being represented in the Olympic rhythmic gymnastics competition. Zetlin barely qualified for the Games after a knee injury last year and admits that she is unlikely to medal. It’s a good thing she is realistic with herself -- after the first two rounds the standings look a bit like they’ve been alphabetized, with “Dmitrieva” near the top and “Zetlin” near the bottom. The competition consists of a four-part rotation: hoop, ball, clubs and ribbon. Competitors are judged based on difficulty, artistry and execution with penalties issued for miscues. The highest combined score across the four rounds is the winner. 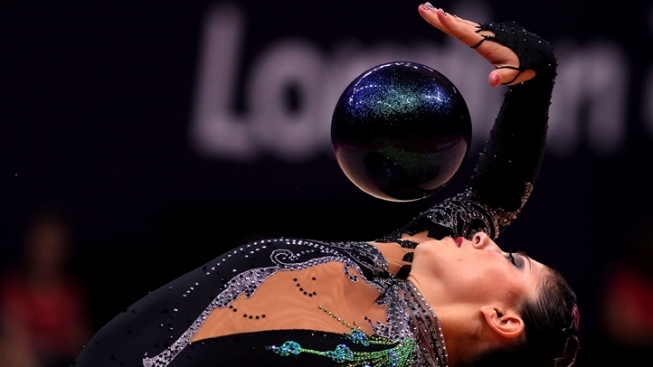 The first U.S. contender for rhythmic gymnastics in eight years, Julie Zetlin is representing America in a sport that combines motion, grace and athleticism for a visually stunning display of showmanship. That will certainly not be Julie Zetlin. After the first round she scored a 23.750 on a routine with a 7.4 degree of difficulty -- that placed her last. The second round was a small step uphill, a 24.450 moved Zetlin up to 22nd. Since the sport’s Olympic debut in 1984, nine of the 11 gold medals awarded have gone to former Soviet states, and no medal of any fashion has ever come back stateside (one did go to Canada). Zetlin isn’t aiming to change that right now -- instead she is trying to popularize the sport and grow the dwindling American rhythmic program. The third round is tomorrow, at noon, where Zetlin will be competing in the ribbon round. She will wrap up competition tomorrow at 1:15 p.m. with the club rotation. The final will be on Saturday at 1:30 p.m., but will all but certainly be lacking Zetlin.